Iran is reported to have freed at least 11 political prisoners, including noted human rights lawyer Nasrin Sotoudeh. The eight women and three men are said to also include the reformist politician Mohsen Aminzadeh. The move comes just days before Iran's new President Hassan Rouhani visits New York for the UN General Assembly. In another development, Mr Rouhani described a recent letter sent to him by US President Barack Obama as "positive and constructive". In an interview with US broadcaster NBC, he said he had full authority to negotiate a deal over Tehran's controversial uranium enrichment programme with the West. He also reiterated Iran's position that it would never develop nuclear weapons. The BBC's Iran correspondent James Reynolds says Mr Rouhani's decision to speak to a major US news organisation shows the importance to his government of reconciliation with Washington. In his election campaign, Mr Rouhani promised to free political prisoners. Ms Sotoudeh was arrested in 2010 and jailed for six years on charges of acting against national security. Her husband, Reza Khandan, said she had been dropped off at their home by prison officials on Wednesday evening. A day after Iran's supreme leader Ali Khamenei backed diplomatic flexibility, the release of a number of political prisoners can be seen as a promising development. On Tuesday, Ayatollah Khamenei told the commanders of the revolutionary guards that it was not necessary for them to "guard politics". The Iranian opposition accuses the revolutionary guards of playing a role in the disputed presidential election of 2009 and the arrests that followed it. Ahead of President Rouhani's trip to New York and nuclear talks, it seems that the supreme leader is trying to portray a better image of the regime to the world. A goal that might be difficult to achieve as long as the leaders of the opposition are under house arrest. He said she had been unaware that she was about to be released. "I am happy that she joined us, particularly as our younger child is starting school for the first time,'' he told AP news agency. "We are very happy but we will be happier if other prisoners are freed." 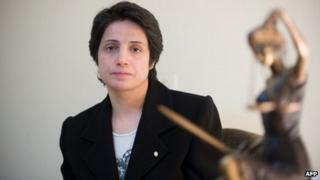 There has been no official comment on Ms Sotoudeh's release or on the other prisoners reported to have been freed. Ms Sotoudeh - winner of the European Parliament's 2012 Sakharov Prize for Freedom of Thought - is a well-respected and outspoken human rights lawyer known for taking on high-profile political cases. During her captivity in Tehran's Evin jail, she went on hunger strike to protest against her prison conditions as well as sanctions imposed on her family. Mohsen Aminzadeh, a former deputy foreign minister under President Mohammed Khatami, was jailed in 2010 for organising protests and spreading propaganda against the system. He was a prominent supporter of the defeated presidential candidate Mir Hossein Mousavi. Analysts say that since President Rouhani's election, there have been growing calls for the release of political prisoners. According to an investigation by the UK's Guardian newspaper, there are close to 800 political prisoners and prisoners of conscience in Iran. They include journalists, lawyers, human rights activists, bloggers, feminists, Christian priests, Sunni clerics, the entire leadership of the Bahai faith in Iran, and others. The releases come a day after Iran's Supreme Leader, Ayatollah Ali Khamenei, gave the strongest sign yet of Iran's potential flexibility in future talks with the West. Iran is subject to sanctions by the UN, the US and the European Union over its controversial nuclear programme. In a meeting with Revolutionary Guards he said: "I don't oppose diplomacy. I am in favour of showing a champion's leniency. A wrestler may give way for tactical reasons, but should remember who is its opponent and enemy." The head of Iran's nuclear agency told reporters in Tehran on Wednesday that he expected "a breakthrough" this year in settling the nuclear issue with the West. "We are very optimistic about the process that has started to resolve the nuclear issue," said Ali Akbar Salehi.